Naturally layered. Reflection of a carousel in a store window. Alternate for the abstract emotion challenge. I've come back to look at this again. It just extraordinary. The gods mist be crazy to miss this one. A timeless mastrpiece. Saw this in the recent comments and remember it from way back when. What shocked me was that I haven't fav'd it. It is outstanding. ... never saw this before now. Wow. Where on earth have you been hiding this treasure?? Amazing. this is totallly totally wild, what a capture. enter it into a real contest or something! Oh Deb! I love this one! And you know what's really funny? The girl in the picture could have been my twin at about age 10 or so. 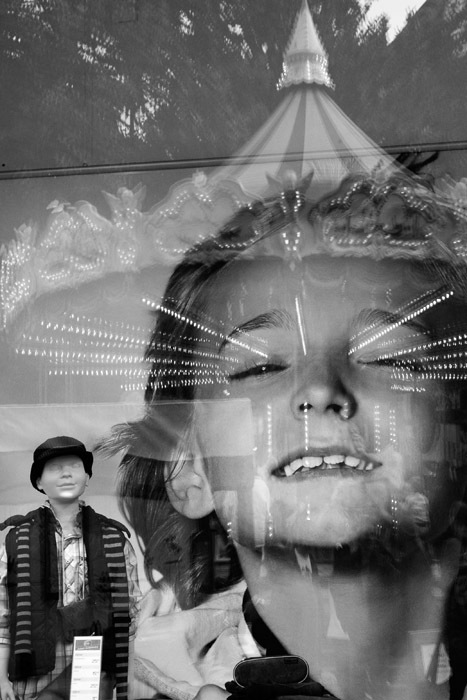 Now that is one crazy effect with beams of light seeming to come out of his eyes and the carousel for a hat, along with the manequin standing blankly observing the whole scene. This may have done very well for abstract emotion (or not of course), but the more you look at it and take it in the more it grows on you. Really interesting shot and effects. Proudly hosted by Sargasso Networks. Current Server Time: 04/26/2019 02:22:11 AM EDT.